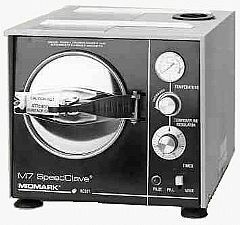 In addition to be known as the Ritter M7 Autoclave, it is also known as Castle Speedcalve M7, and Midmark M7 autocalve. At the end of the cycle, a buzzer will sound and the power to the sterilizer will be shut off. The user will then press the valve lever down in order for the sterilizer to be depressurized. 7" dia x 14" deep (19.1cm dia x 38.1cm deep). 2.4 gal. usable volume (9.0 liters). Two large - 12"L x 5.62" x .88"D (30.5 x 14.3 x 2.2 cm). One small - 12:L x 4.12W x .88"D (30.5 x 10.5 x 2.2 cm). Electrical: 120 V, 60 Hz, 10 amps. Water reservoir capacity: .75gal (2.8 liters).